There's a new competitor on the block for the traditional dhaba* (truck stops) on India's highways. Reliance Industries has launched 'Reliance Dhabas' along side Reliance gas stations as the group's initial step towards their giant retail plans. 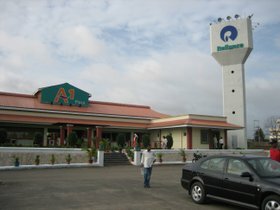 I went to Kurnool for a day trip and we stopped at a Reliance Dhaba on the way. This was my first experience at a Reliance Dhaba, although I had heard about them via online Indian newspapers, while I was in NYC. We pulled into a clean well-maintained parking lot. 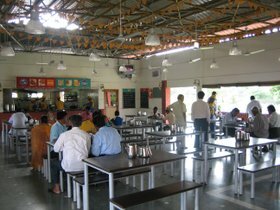 The Dhaba itself was large and clean, like an Indian Mc Donalds. The menu was surprisingly extensive complete with traditional south Indian fare like Idlis, Dosas, Vadas as well as kebabs, curries and Biryani. We ordered idlis and coffee for breakfast. The service was prompt and courteous and we didn’t have to wait longer than 5 minutes for our order. I must say the idlis were top notch. The rest-rooms were surprisingly clean by Indian standards. 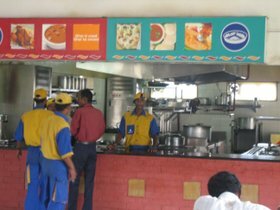 I will definitely be keeping an eye out for Reliance Dhabas on my road trips in India. * See previous post in dhabas. The photos are too small to enjoy.